At a small business, your website serves as a vital component of the marketing strategy by connecting customers with the product or service. However, if the website doesn’t function at its best, then it slows down the entire marketing process, and can even hurt potential sales. One of the main ways your website can function best is through a responsive design. With modern technology, a responsive website is not only vital for marketing efforts, but for overall sales growth. What exactly is responsive website design, and why does it matter for your business? Let’s dive into a few reasons why your business website should be responsive. First and foremost, a responsive design means the website format adjusts to fit whatever screen size it is viewed on. Whether you see the website from a computer, tablet or phone, it will reposition and realign all text and graphics to be visible in the best way possible. 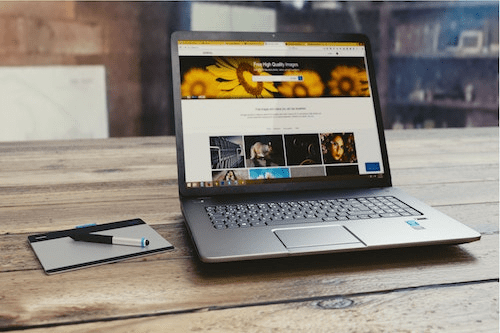 Not only does this allow you to maintain one business website—rather than a desktop version and a mobile version separately—it also has a variety of other benefits. 1. Responsive is preferred by Google. The most important benefit to keep in mind is that responsive website designs are preferred by Google. Because responsive websites have one URL and the same HTML code, it makes it easier and more efficient for Google to scan through your site’s information. This means responsive sites are better optimized for search engines, making them higher in search engine rankings and allowing potential customers to find your business easier. 2. Responsive fits on mobile. Here’s the deal: your website should be mobile. According to a 2018 study by the Pew Research Center, 95% of Americans now own a cellphone of some kind. Not only that, but 77% actually own a smartphone, which is up 11% from 2011. This means if your website does not adapt quickly and easily to a mobile screen, then you are missing out on customers. With a responsive design, you can feel confident that your website will always work on mobile. 3. Responsive allows easy mobile purchases. By meeting customers where they’re at on their smartphone and providing a website which is easy to read, easy to maneuver and easy to browse, a responsive design also allows easy mobile purchases. For customers who do choose to visit your mobile website, a responsive design makes the purchasing process easier because it is designed to function on a mobile phone, which can improve overall sales for the business. This brings us to one of the greatest benefits of responsive design: increased conversions. Responsive websites can improve your business leads and conversions. In one 2013 study, Google Mobile Search Moments found 55% of conversions from mobile search happen within one hour, e.g. a phone call, visit or purchase. Because responsive design makes your mobile site so easy to browse and use, your conversion rates are likely to rise significantly. 5. Responsive requires minimum maintenance. Finally, what’s the best part of a responsive website design? Minimum maintenance required. Before responsive design became popular, businesses either had to use the same, clunky website on mobile, or try to maintain a separate, dedicated mobile site. Neither way was very effective. Now, whatever adjustments you make on the desktop version of the site also appear on the mobile version, already adjusted and reformatted to fit easily onto a phone screen. This makes maintaining and editing your business site easier than ever before. There’s no doubt about: a responsive website design is the way to go for businesses. Not only can a responsive website design improve your marketing efforts, but it can also increase sales. Try one out and see how the business can grow from it.